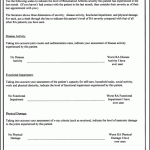 Rheumatoid Arthritis Severity Scale (RASS) Affecting Treatment Decisions? Could the RASS Affect Treatment Decisions Dollars? 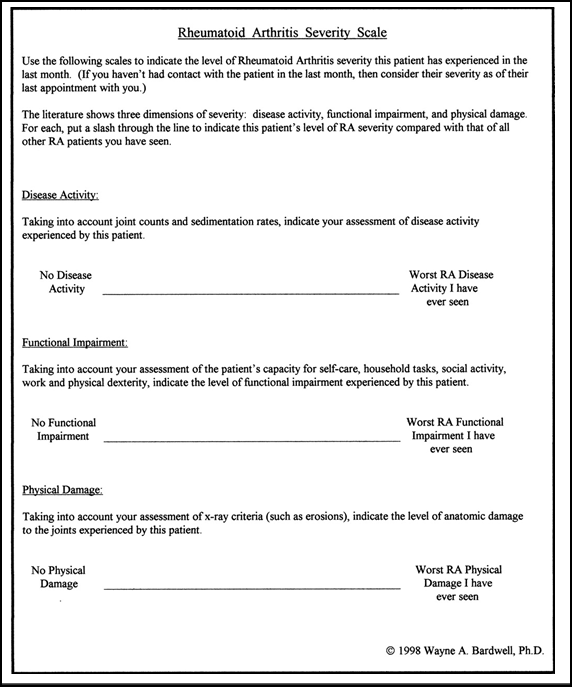 We’ll look specifically at the Rheumatoid Arthritis Severity Scale (RASS) in a moment. Consider first why an RASS is wanted. Measures of Rheumatoid disease activity are still in a crude state of affairs. Measuring response to treatment is usually based upon a subjective opinion of a doctor. Various treatments are very effective on a minority of patients and there is no way to identify beforehand what works on whom. Treatments often also quit working. Cost-effectiveness is difficult to ascertain since disease pattern is not easily predicted; it’s difficult to determine how many joints have been saved or years of work have been preserved in a patient who responds to treatment. So, yeah, I get it. They don’t want to “waste” money on us with no guarantees. I’m sure patients would like some guarantees as well before they risk their lives or spend a fortune on treatments. Unfortunately, science has not caught up with that. The Rheumatoid Arthritis Severity Scale (RASS) was developed in the 1990’s and published in the Oxford Journal of Rheumatology in 2000. It does not seem it has been cited often and the only recent citation I found is the 2010 article about the discordance between patient and physician assessments in RA, a topic we’ve mentioned previously, Physician Discordance in Assessments of Global Disease Severity in Rheumatoid Arthritis. While I see reasons to desire such a scale as discussed above, I doubt this RASS will become the tool of choice. There are also objectionable aspects to the RASS described in the Oxford Journal. Some of these have been discussed on this site previously as significant problems in rheumatology research or care. An assumption of a “tendency towards somatization” or “dysphoric mood” in RA disease which is assumed to interfere with patient outcome measures. An assumption that “the judgements of rheumatologists” are as accurate or superior to patient self-report measures. “Chart review” and “x-ray evidence” are used by physicians completing an RASS, concerning because of medical chart errors. It says they think RASS is quicker than the HAQ but just as accurate – as if that’s encouraging. We’ll save my improvement suggestions for the HAQ for another day. Has your doctor or insurance company mentioned the RASS or another scale to you? ← Hey Superman! Does Accepting Limitations Make Us Weaker? Considering it took three rheumatologists to decide that I was sick and needed more than Sulfasalazine, I do not believe that a doctor’s opinion of how I am doing is superior to my opinion of how I am doing. Together, our opinions should matter, but not separately! excellent point. And one we see repeated in many patients. The real question is, what are the insurance companies doing with this information? Are they using it to approve or deny coverage for a medication or are they using it to verify the evidence of the need for the medication? I cannot figure out what they want in these assessments. How do I feel? As compared to what? Yesterday? My neighbor? Also, there is no typical disease projection. The joints in my feet were being destroyed with no inflammation and blood tests that really weren’t that bad. The doctors looking at me would think I was doing very well, because I didnt swell or turn red. Ann, physicians’ understanding of the disease varies greatly, as you know. But even on a molecular level, science knows so little about how it works. It’s not reasonable for doctors, much less people in offices miles away, to expect to have clear objective projections of whether treatment is “worth the money.” We are a million miles from being able to tell that. And your example is evidence of it. Many of us know that our bloodwork is only telling part of the story. Mine has shown no signs of inflammation, yet my hands look like boxing gloves due to the swelling. I have an excellent Rheumatologist who knows this, however. So make sure you tell yours EVERYTHING. These new insurance concerns may be a result of ObamaCare… there will be cuts all over the place, especially those deemed medically unnecessary and/or unworthy. I assure you, Debra, there’s nothing in the “Obamacare” legislation that’s gonna make ins co’s do this. If they are trying to get out of paying for something by doing this, they would be doing so with or without health care reform. This is exactly why we need regulation… big corporations, esp health ins co’s, don’t care about people, only profit. I have blue cross/shield insurance – anyone ever been presured to join the “complex care” program? It was explained as professionals who would monitor & help me by phone in planning & answering questions about my health care & medications. Seems like RA patients are getting squeezed from both ends to control costs above proper patient care. I do not trust the insurance companies! The power they have scares me! Anyone who between doctors and patients who has power to make decisions can be scary – whether a company or a government. They have an interest in people NOT receiving care – not a logical way to set up a payment system. Considering what RA is and how it works on our bodies, I don’t understand how RASS can even come close to being useful! There are just too many variables involved in the level of pain we are feeling at any given time. I have had blood work and sed rates in the “normal” range and I am in excruciating pain. At any given time of the day I can have pain and then a few hours later, either no pain at all or pain some where else. Is the pain being measured when there are no meds involved? When meds are regularly taken? When we are on meds plus pain killers? Yes, and not to mention more serious or systemic health problems caused by RA including fatigue, stiffness, weakness, anemia, vaculitis, Sjogrens syndrome, heart or lung problems… – none of which would be considered if only joint pain & visible deformity are considered. That’s what this is all about right? It’s not about making sure patients get treatment they’re needing, but about allocating resources only if they have to. Just makes me sick. Some exec somewhere is driving a 100,000 dollar car and living in a multi-million dollar house and is trying to squeeze us out of a medication or a treatment of some kind in order to make a few more bucks. Am I wrong about this? Why would ANYONE want to take these horrific drugs if they weren’t suffering? I just don’t get it. If we say we’re in pain and need more help, or need disability, we ought to get it. Just this guys thoughts. LOL You’re the first one to comment on the list publicly. I got an email mentioning the irony dr’s cultural ignorance to name the poorly conceived test “RASS” considering the top Google result. I vote for the first google result – this isn’t an evaluation, it’s really just so much BS. Sounds like another way for your insurance company to deny you access to the more expensive biologics based on your RA not be severe enough – like they would know! All because the Dr. marked the line one millimeter to the left instead of to the right. There’s no marks on the line either – how’s he supposed to figure out where on the line is “severe enough”?It just looks random. I couldn’t agree more about the hour to hour pain range! What is frustrating in my circumstance is that as a trucker, it effects my driving and my job- let alone safety and liabilities. But, a test could potentially reflect, “Nah- she’s good.” And a flare or flinching, cramping pain could easily disprove that at higher costs.